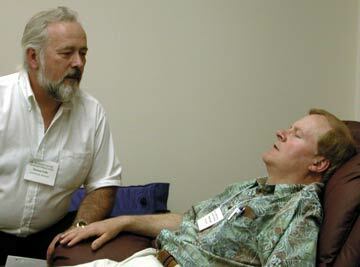 Left: Calvin Banyan demonstrating how to do an instant hypnotic induction. 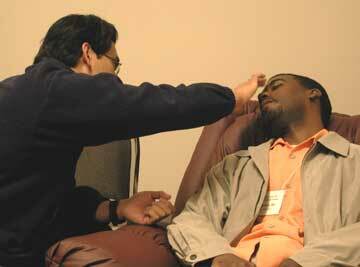 He then demonstrates a quick deepening technique which takes Elliot (a student) into deep hypnosis (somnambulism). Next, Elliot is led into a real age regression (revivification). All three, induction, deepening and age regression accomplished in about two minutes flat! Once Elliot is regressed they visit Elliot's 5th Christmas, first day of school (regressed to age five), a time playing with cars on the floor (age 3) and finally a time as a toddler. All very pleasant experiences for Elliot. Right: Here Elliot and Terry practicing the skills they are learning. At this time they are practicing rapid hypnotic inductions and learning how to properly take someone into an age regression. Terry is seen here hypnotically re-experiencing a pleasant time in her childhood. These new skills will be practiced many times under the supervision of their instructor and other graduates, or experienced hypnotists. In this way, when these students become graduates, they will be confident that they have mastered the techniques. Left: Matt is working with Elliot who gets to go into hypnosis again. Matt is also working on a rapid induction. This time he uses a modified Elman-Banyan hypnotic induction. Matt is learning how to use proper wording during age regressions. This will improve the quality of the revivication without leading or contaminating Elliot's experience. These skills will be very important when doing hypnosis. Right:Tom is doing a great job of taking Mike into a very deep level of hypnotic somnambulism, in just a few short moments. This is their first day doing the shortened version of the Dave Elman induction. In a couple of days, they will move on to learning the principles of an instant induction, which can take a willing subject into deep hypnosis in only seconds! 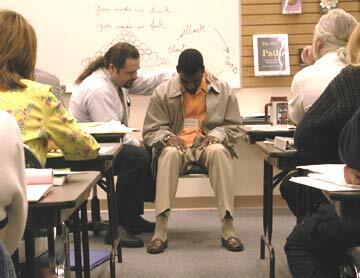 Then the class will go on to learn forgiveness work and our special parts work, Parts Mediation Work.